I bet you thought all those wonderful iPhone apps like Storytree, Mosaic, and the like are great examples of moving digital images to tactile printed books. Well, you’re right. 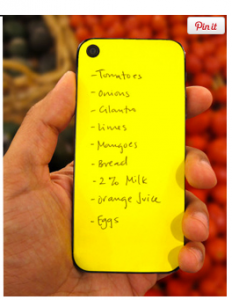 But did you know that the iPhone can also double as a hard writing surface for taking notes? That’s right folks – with a $400 price tag, this amazing tool can actually assist you in both digital and analog applications. Why do you need an analog solution for writing notes when you have a digital one in the palm of your hand? I don’t know. What I do know is there’s just something great about paper and pencil, or paper and ink. I can’t explain it. Taking digital notes is not hard, but I much prefer to write them down. What’s that? I’m old? True, but why are so many millenials buying and using products like these? There as so many digital apps which are now exploring how to bring the results to their customers in some type of printed form. Last year, our parent company, Progressive Solutions, started manufacturing photo books for other companies. We currently have no less than ten different customers and prospects trying to launch some type of printed solution for their online store or application. We can’t build these integrations fast enough to keep up with the demand. Keep on bringing beautiful designs. There will always be a place for them on a tactile substrate, and people will always love and appreciate what you do. What’s your take? Is print going away or here to stay?